Alexander Pavlov was born in 1963 in Donetsk. He graduated from Mukhina Art College in St. Petersburg. Member of the Artists Union of Russia, the International Federation of Artists UNESCO, the Commonwealth of Independent Artists (St. Petersburg). His works are in private collections in Russia and abroad. Lives and works in Moscow. 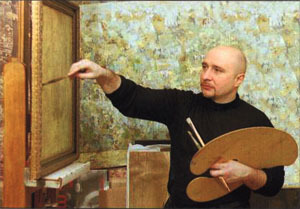 Cooperates with "Alla Bulyanskaya Gallery" in 2000.